Playing is essential in the holistic development of all children. Play contributes to the cognitive, physical, social, emotional and psychological well being of babies and small children. 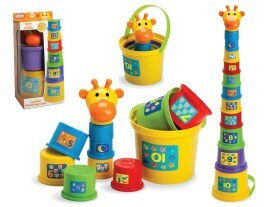 Playing also offers an ideal opportunity for parents to engage totally with their baby or children. Free child centred play is as important in the development of on going life skills as is physical activity which has so many positive benefits for even the smallest humans (see Tummy Time for further information). The young baby or child who is read to from an early age, will eventually learn to sit still and listen to the story or nursery rhymes being read to him. The first essential for a child’s development is concentration and as the baby or child gets older he will learn to inter-act and fully enjoy being read or sung to. 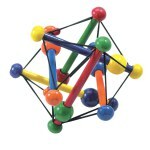 This encourages concentration and thought provoking inter-action between child and carer. From the illustrations and objects on the pages in the books he will learn some of his first words, colours, numbers, word recognition and eventually the skills to read. Most importantly he will learn to appreciate books and the joy they can bring to every child’s developing world. See our list of suitable books for very young babies below. 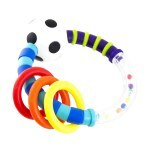 From the age of approximately 3 months a baby can be handed a light weight rattle or object to hold in his hand. At first he may not hold it for long but gradually he will grip and enjoy holding the toy. Once the grasping skill has been mastered a baby will grab objects consciously and unconsciously commencing the first stage of play using his hands. At birth grabbing is an instinct, by the time a baby is 3 months old grasping is a skill a baby will practise as his hand eye co-ordination is slowly developing. Even though he may have been previously attempting to put everything he grips in his mouth along with his hands and fingers eventually he will learn to observe the object, even shake or bang it against another surface. By 4 - 5 months he will attempt to grab or pick up larger objects. If lying under his gym he will attempt grabbing or swipe at anything hanging above him and he will also continue to put most objects he grabs, into his mouth. 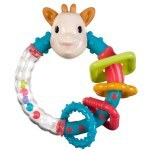 It is essential once your baby is able to pick up toys to ensure there are never any small or dangerous objects within his reach as these could be a choking hazard. See related articles at the bottom of this page on choking in case of an emergency. Once your baby is sitting up by himself and able to pick up toys and play for short periods of time you can add new toys to his collection. 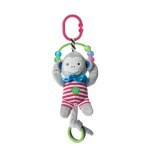 Soft brightly coloured toys are still suitable for him and there is a huge range of toys for young babies in stores and online. Look at some of those recommended items on our site, most can be bought on Amazon or John Lewis, you can log on from here. See the article on Tummy Time and Rolling as these developmental milestones are also part of Play. 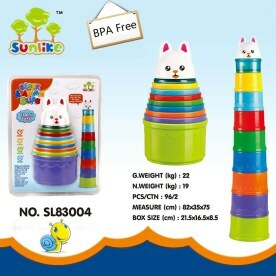 You will also see toys we have selected to buy for this period of development. 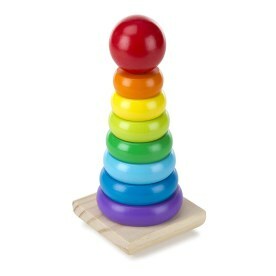 Once your baby is sitting up independently you can encourage play with toys he can reach out to grasp and pick up. Initially place small soft toys for your baby to grab and as he gets older you can introduce him to other toys he can handle easily. 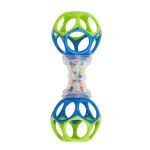 A medium size ball, bean bag a toy with wheels he can push or just one of his favourites such as a rattle he loves or a squeaky toy e.g. Sophie the giraffe. 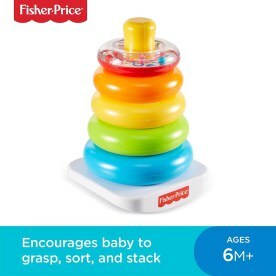 Encourage activities such as Stacking by showing your baby how to sack toys on top of each other, stacking towers are a wonderful gift for a 12 - 18 month old and a baby will play with them for many months to come. Putting shapes through holes is also fun and if you introduce these types of games to a baby who is sitting up and paying attention eventually your baby will attempt this activity himself. This type of activity is recommended more for a baby of nine to eighteen months as are puzzles however it is never too soon to introduce new activities. Once your baby is crawling he will find it far more difficult to sit still and will be up, up and away which will become more demanding for anyone caring for a young child. Once he has mastered pulling himself up and is toddling about and eventually walking life will become even more tiring for the carer. 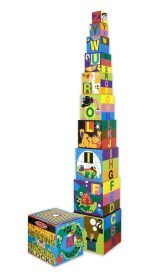 Therefore quietly reading or playing with toys on the floor will become more time consuming and it will be more difficult to gain your charges attention as the little explorer will find far more fun in being on the move. In order to continue with book reading and quiet times together during the day, you can choose a time when your baby is less energetic e.g. before a nap or every evening after his bath when he will be relaxed and less mobile. Babies love to laugh and giggle, so they will enjoy and respond to anything a parent or carer can do to make them laugh. Reading books once a baby can focus is so much fun, the beginning of the enjoyment of story time for many years to come. Explore sensorial books which provide touch, feel pictures and lift the flap pictures, for little ones from approximately 9 months on wards. Building up, stacking cups and blocks and crawling round the floor pushing toy cars, buses, trains and lorries, is fun and you’ll find Daddies are particularly good at this, baby girl’s love this activity too. Swimming with your baby is a great way to encourage one-to-one fun and attention along with freedom of movement and further sensorial experience. Once your baby is four to six weeks old it is more or less essential to take him out and about in his pram and also good exercise for you. It is recommended that if possible a pram where your baby faces you so they see your face from birth is preferable (see the article we have below).